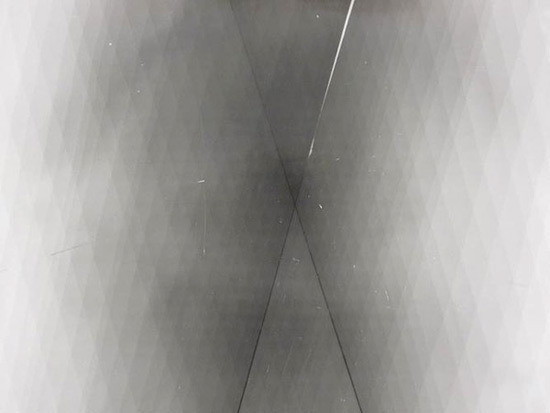 Like the post-Minimalist response of the 1970s, there are a lot of messy squares and rectangles – but in place of a dogma for or against meaning, the work invites themes of decay, failure and waste as ways to address the impermanence over time, of structures visible and invisible. In the year 2038, the U.S. Department of Energy will forever close the doors to its Nuclear Waste Isolation Plant in Yucca Mountain, Nevada. In accordance with the regulations that govern such things, the Environmental Protection Agency maintains that a system of warnings must be permanently installed at the site, capable of deterring any visitor for the next 10,000 years – whoever or whatever they may be. What should such a warning look like? To answer this question, an incredibly diverse committee of experts was assembled called the “FUTURES PANEL” to brainstorm ways to universally indicate to any would-be trespassers that they do not want to be here; that what this site marks is not glory or treasure, but danger. In its desire to communicate across cultures, Modernism can also be seen as an attempt at a super-language, a kind of visual Esperanto that would not be limited by regional dialects. Minimalism retained that noble pursuit: to synthesize an ideal form that transcends political divides. Additionally Minimalists took the conversation in a new direction when they borrowed fabrication techniques from industrial facilities to make their work, acknowledging aspects of our world that earlier Modernists had not. But the democratic choice of everyday materials like steel or fluorescent lighting were meant to be innocent in their commonness, acting as a sign of good faith to the common man, and in this way still maintaining the initial pursuit of unity. Unfortunately, this project only works for so long. Language changes on us – including Art – and today the language of Minimalism doesn’t mean the same thing. To many the work reads as cold, austere, and rigid; even fascist. So what’s the solution? How can a warning sign bearing a skull and crossbones be an effective deterrent to a visiting species who don’t have skulls? Today, the idea of a universal language is something that most artists no longer accept. How could one object mean the same thing to all people? Even if that object were not a deposit of nuclear waste, but a Modernist sculpture, whose message was that it didn’t even have a meaning? Instead of such strategies, we now prefer to consider what interesting things might happen when these visual languages break down, as all things do over time. In place of a super-language, MIN. shows us a group of such artists who play with the mechanics of the Art object, just as one takes apart an old clock, to see how it works, or worked. What if a Future Man came upon the ruins of an Art museum? What would he make of the thing called a “Donald Judd”? What on Earth might this special thing have been for? This thought experiment is helpful in that it pictures Modernism as a dead language, thereby liberating it from the stale conversation to which it belongs. The impulse to imagine such rhetoric being lost in the sands of time is tempting, indeed; so much so, that I found myself using it as a lens for the whole show. Three sculptures by Elaine Cameron-Weir approach the issue head on. 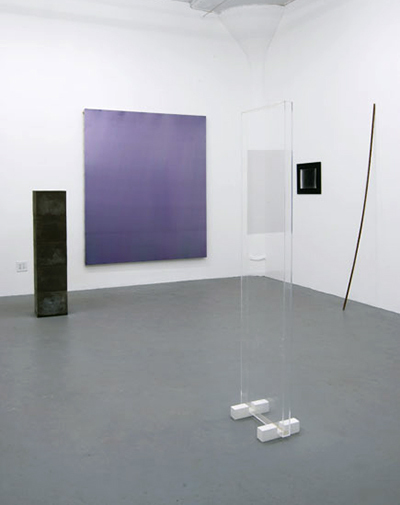 Each takes a Minimalist trope (the vitrine, the stack, the leaning stick) and complicates it with a different organic material (shredded tea or tobacco leaf). Nearby, she casts a column in five cubes of concrete and girl’s perfume oil. While I can’t quite say what the fragrance tells us about the sculpture’s personality, it certainly gives the piece a gender, and blurs its boundaries as an object. Though still box-like in shape, the piece itself cannot be put in a box any more than you can smell these words as you read them. This stubborn unboxability works as a kind of metaphor for the artwork’s relationship to its own content. Pursuing a different strategy, Ben Morgan-Cleveland covers stretcher bars, not with canvas, but cotton and spandex off the roll. Then sealed in plastic and brown packing tape, they have the functional look one frequently sees as an art-handler. This theme continues in Capalino’s own contributions: a tarp and a packing blanket, each of which is also stretched in place of a canvas. The vocabulary of art-handling is a very specific language, based on the utility of transport. It is certainly not a reference that will endure very far into future times. Instead, it speaks to specific moment – a rare moment on the job when, while moving a crated sculpture or wrapped painting, these ubiquitous dressings temporarily lose all meaning, and become invisible. The objects appear, not as quotidian material, but as pure form.